Obviously, I love sweet treats. When given a choice between sweet and savory, especially for breakfast, I’m usually tempted by baked goods. But give me an amazing egg dish — one stuffed with seafood and cheese — and I’ll happily dig in. 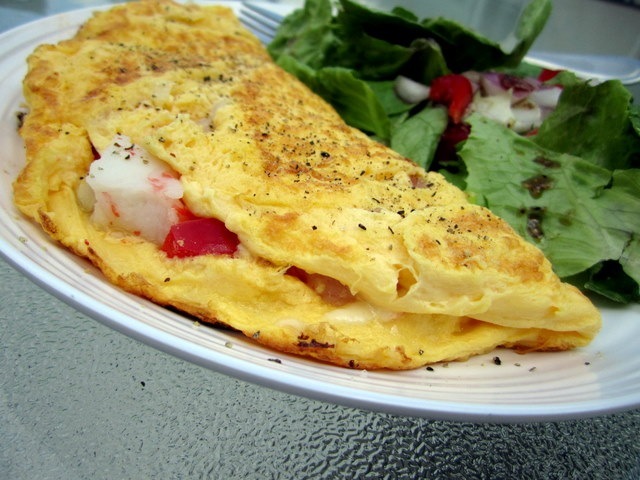 And now, here’s my love letter to this Crabmeat and Mozzarella Omelet. There really just are not enough words. I love sitting down to plan out and test recipes, but this one started with an impulse buy — I’d picked up a package of Trans-Ocean Crab Classic on a whim, after seeing that it was on sale. Then, as I went through the fridge to check on our supplies, I noticed that the expiration date was fast approaching. So, I scrambled (bad pun!) to come up with a way to use it. Luckily, I didn’t have to think too hard because there was a recipe right on the package for a Crabmeat and Mozzarella Omelet and it sounded so good, I gave it a try. Saute red pepper and onions until soft, about 5 minutes. Remove from pan. Spray pan and add eggs/egg substitute. When first side is done, flip over, fill with crabmeat, cheese, peppers, onions, salt and pepper. Fold over to form the omelet. I honestly never thought I could love crabmeat crab-flavored seafood so much. I mean, seriously…this omelet was just fantastic. Has anyone else ever tried this combo?? Amazing, I tell you! 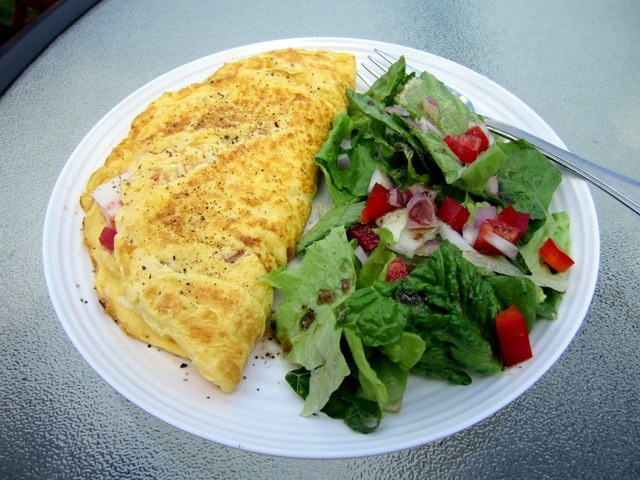 I served some mixed greens alongside my omelet, sprinkled with the rest of my peppers and onions and a drizzle of balsamic vinaigrette. So, so good. How do YOU spell omelet? Omelet or omelette? I honestly just keep using “omelet” because that’s what Windows Live Writer seems to tell me is correct, but I’ve seen it written both ways and am never quite sure…? Omelette? haha. Not sure!? That does sound good and I have crab "meat" I need to use up - the fake stuff too! I love shrimp or tilapia the most I think. I use Windows Live Writer as well and have gotten used to spelling it omelet. I haven't gotten the Crab Classic stuff in a while, but it's great for adding seafood to a pasta dish as well (I tossed mine in a little butter to flavor, then added it with pesto sauce). Favorite seafood is seared tuna. As in, toss it on the grill to make the outside just turn color and then take it off. Mmmm. Second to that are steamed Maryland crabs. I could destroy some of those right about now. OH crud, I had a funny response and I lost it. I use omelet - just because it's easier to remember. I can never remember how many m's and t's and l's are in omelette (Google Chrome is telling me that's wrong too...). My fave seafood is little neck clams - mmmm I can eat them raw with horseradish or hot sauce, or steamed with drawn butter OMG. post yoga, it's always ommmmmmmmmmm-let. And my favorite seafood (so far!! just dipping my toes into the vast ocean of options as a seafood newbie) has to be blackened mahi mahi. Always a treat, I had it for dinner last night and lunch today. One mahi for each! I've seen it spelled both ways too. I use omelet. I don't really do seafood. Maybe it's because I grew up in the land of beef and cattle but I've never really developed a taste for it. I have been able to eat fresh trout and some other clean tasting white-fleshed fish, but it's never my preference. One regret I do have though - we honeymooned in Bar Harbor, Maine and DIDN'T eat fresh Maine lobster. I just didn't want to spend the money on something I was pretty sure I wouldn't like so we didn't...regret it now...if only for the experience. The first question just took me by surprise now I don't know which one I normally use. Guess I don't spell it out often enough to know lol. Definitely a lover of crab!! Had the best crab quiche ever when I was on my honeymoon in July! I usually spell it omelet but always want to be fancy with the extra t and e. For some reason I think that's the French way of spelling it so it could be right either way. Shrimp is definitely my favorite seafood! I have always spelled it omelet. 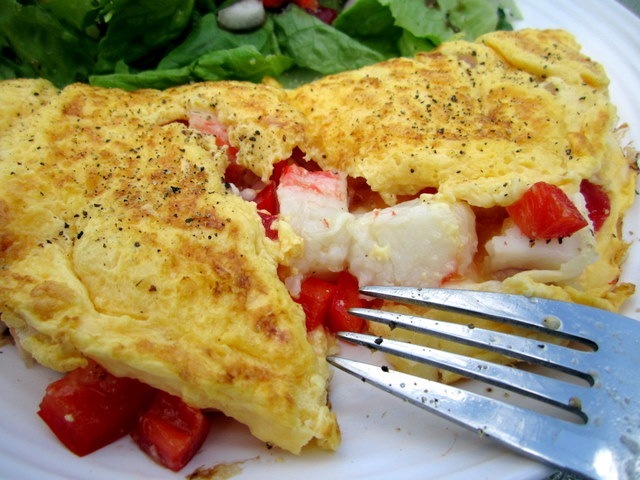 Your crab omlete looks so good! I love steamed crab legs, shrimp, fish, lobster, crab almost all seafood. There are several things I don't like and I'm kind of picky of how it's cooked. PLEASE come cook for me, Court! I am in love with your lunch, too. Fav seafood? Crabcakes! For a "healthy" seafood I usually go salmon alllll the way! I have no idea how I usually spell it! I guess I must not type that word all that often??? I love imitation crab meat. I used to make crab salad sandwiches a lot when I was younger, but somehow I lost track of that. My favorite seafood is (REAL) king crab, but scallops are a close second. Honestly, there's not much seafood I don't like! I spell it "omelet" and don't think I've ever seen it the other way. Favorite seafood: definitely scallops! Love them! Omlette! :D crazy windows live ;) I hate all seafood. Except breaded fish haha... I'm fussy. Ohh that does sound delicious! I go with the first spelling usually but I've seen it both ways. Omelette seems too fancy for me! That omelette looks delicious! I tihnk I use omelette because I took so many years of French class that it just looks right to me. :) I'm very picky with seafood. I only like shrimp, crab, lobster tail, scallops, clams and smoked salmon. Yum!! Sounds delicious!! I love crab, shrimp, and lobster ... but I don't think I've ever had any of those things in an omelette before. And I guess I spell it "omelette" ... honestly, I think I have to look it up every time I write it haha! I spell it omelet... I guess I've seen it spelled both ways, but I never really thought about it until now! 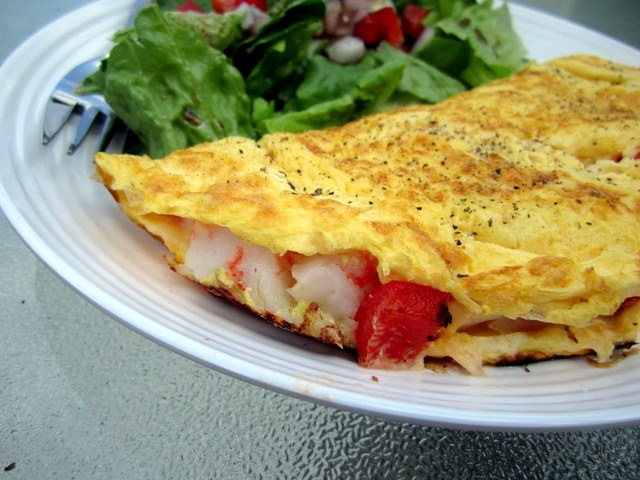 Your omelet looks AMAZING by the way! What a perfect combo. My favorite seafood is probably shrimp or salmon! I always spelled it omelet but I've seen it the other way too. My fav seafood is definitely crap. I had a seafood packed weekend this weekend because I took a trip to Boston. I enjoyed a lot of clam chowder and crab cakes! I'm not sure which way is correct. I think I usually do omelet, but omelette seems just as right however it always come up as spelled incorrectly. Not sure. I think I usually spell it omelet! I looove lobster & scallops! That looks delicious! I've never thought to put crab meat in an omelet. I think that's how I spell it? haha I love almost all seafood but I definitely love salmon and tilapia a lot. This is what I found: "For the dish consisting of beaten eggs cooked until set and folded over, Australian, British, and Canadian writers prefer the French spelling, omelette. American writers prefer omelet by a wide margin, and U.S. dictionaries and usage guides concur." 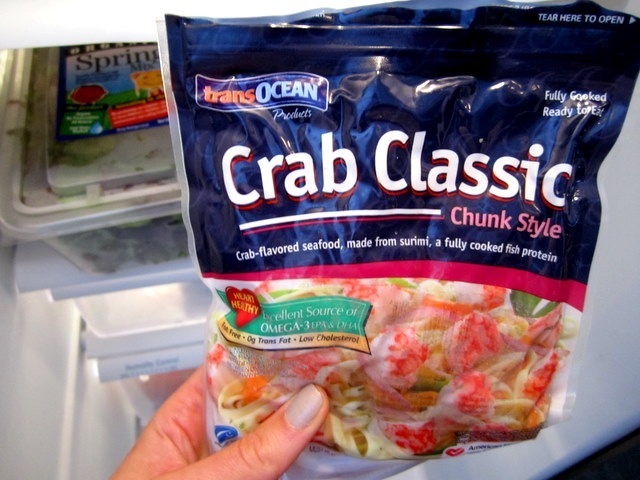 I love crab, and also imitation crab meat too! I love seafood in general, but lobster has to be my favorite :-) I usually spell it the french way, omelette, but either spelling is perfectly ok and correct. This idea is truly AMAZING!!!! How has this thought never crossed my mind?!?!? I always spell it omelet because it's easier. And this omelet looks like it was made for me. Wonderful combo! That's such a funny question because just today I was seeing a client and this came up. He orders a special kind of omelet from a delivery service, and I was looking it up on the internet to find the nutritionals... it kept auto correcting me! I've had crab omelets just like that before!! SO good!! That looks fantastic- love crabmeat! I go with both spellings, more of a case of what computer I'm on and what it has programmed! I'm so jealous of your omelet! I'm out of town with work and have had the worst food! I'm craving REAL food and that crab combo is going to haunt me until I get home! Yummm! I love seafood. My favorites are salmon, cod(which I'm baking tonight), shrimp, and scallops. I love to get creative with stir frys and sometimes I like to just grill or bake salmon and have it with a sweet potatoe. I flip flop the ways that I spell omelet it seems like! It just kind of depends on the day! My favorite seafood is any white fish and shrimp. raised in Maryland on blue crabs, i find your use of FAKE "crab" blasphemous b/c it is, well, disgusting. try the real thing, you won't regret it! PS plz at least change the name of the recipe so it won't come up in other's search for a crab omelet recipe and waste their time - it's rather disingenuous.